Muhammad Ali Turgunov., et al. C-CVD Grown MWCNTs Disclosure of Defects by Influence of Drying Condition on Carboxyl Functionalized Structure. (2017) J Nanotechnol Material Sci 4(2): 39- 47. © 2017 Muhammad Ali Turgunov. This is an Open access article distributed under the terms of Creative Commons Attribution 4.0 International License. MWCNT; Van der Waals; Functionalization; Dehydration; Vacuum- freezing; Vacuum-heating, Carboxyl group (COOH); pH; FTIR; SEM; EDX. C-CVD grown Multi-Walled Carbon Nano-tubes (MWCNTs) as reinforcement have shown excellent mechanical, thermal properties as long as homogeneously dispersed in the matrix (polymer, epoxy and etc.). Modification of carbon nano-tubes is the base steps to prepare the surface microstructure to strong bonding with matrix thereby decouple bundled nano-tubes due to Vander Waals interactions. The main purpose of this research work is modification of MWCNTs in order to obtain less damaged and strong bondable nano-tubes and comparing to two vacuum-drying methods to find most effective one. In this research, we carried out by sulfuric and nitric acid treatment (H2SO4:HNO3) as 3:1 v/v to modify the side-wall surface. Two types of condition of dehydration have been performed during 24 hrs: heating (120°C) at 750 mmHg and freezing (-80°C) at 1900 mmHg to obtain qualitative MWCNTs with low viscosity and higher aspect ratio. It is believed that the most important factor is low viscosity within higher loading of MWCNTs. Quality of well-dried functionalized multi-walled carbon nano-tubes (F-VFD MWCNTs) can be estimated as well in creating well-oriented nano composite. 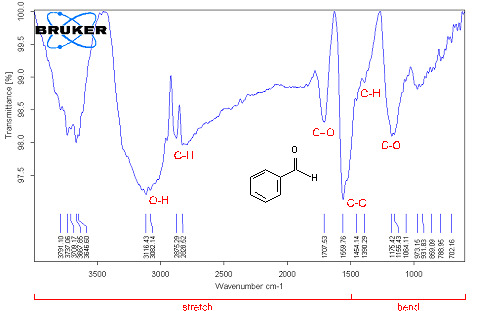 A quantitative characterization of presence carboxyl (-COOH) group on the external wall observed by Fourier Transmission Infrared Spectroscopy (FTIR). Disclosure of defects and disruption on the graphitic structure of F-VFD MWCNTs was analyzed by Raman Spectroscopy. In order to enhance dispensability, it is necessary to quantify the F-VFD MWCNTs dispersion quality after applied chemical modification. Although, purity of F-VFD MWCNTs was analyzed by Energy-Dispersive X-ray spectroscopy (EDX) to predict in-organic and metal impurities after performing functionalization. Observation by Scanning Electron Microscope gave us clear view of structure surface of MWCNTs. According to the results, we found out that effect of drying temperature is one of the critical factors to obtain less damaged and strong bondable nano-tubes regardless of matrix thereby to improve mechanical and thermal properties of nano-composites in advance. The results showed the effective influence of functionalization (unlocking) on the interfacial interaction between MWCNTs and isophthalic polyester resin which obtained after performing vacuum-freezing dry method. Generally, nano-materials reinforced by MWCNT are becoming a newest area of research investigation for scientists especially, who related work with materials science and mechanical engineering even medicine. More and more comprehensively investigations of carbon nano-tubes are presenting new methods as reinforcement in nano-materials and opening new remarkable applications to apply for many industry and military innovation[1,2]. Unbelievably properties, such as resistance and flexibility make them ideal candidates as reinforcement materials in polymer nano-composites. The basic idea is to create ideal nano-composite material, where carbon nano-tubes properties transferred to a polymeric matrix to make a strong bond. In the process, it is very difficult to achieve a good adhesion at the MWCNT and polymeric matrix interface. Because, electrostatic and Van der Waals forces cause that agglomeration of the nano-tubes in bundles and entanglements. As known, pristine MWCNTs have poor disperse ability in the polyester or even epoxy because of their bundled and tangled structure originated from strong Van der Waals forces, which become a barrier in way to reach the high level of physical properties. These deficiencies might have affected on the characteristics of nano-composite, until a method to disperse nano-tubes homogeneously in the matrix will not be found. Attractive Van der Waals forces between nano-tubes are difficult to quantitatively measure with any surface force technique since these forces increase by orders of magnitude close to the surface[3,4]. However, the observance of the Van der Waals pressure indicates that even electrically neutral bodies attract. The major disadvantage of carbon nano-tubes is the strong tendency to aggregate to form bundles in low viscosity fluids, which hampers molecular level studies and device applications perhaps due to the Van der Waals forces. Moreover, theoretical calculation and explanation of Van der Waals forces between nano-tubes is quite limited. When carbon black particles are dispersed in polymers, two comparative forces have to be considered, touching particles stick together due to the Van der Waals forces of attraction, and second, the surface of particles dispersed in the medium becomes charged, which causes a repulsive columbic force. Functionalization and oxidation have shown to be feasible and effective means of improving the homogenously disperse ability and distribution of nano-tubes into a matrix. However, dehydration temperature MWCNTs tend to aggregate and their agglomeration in common solvents in polymer matrices is the results in unsatisfactory effects. Consequently, various methods have been proposed for functionalizing MWCNTs. Functionalization of MWCNTs for polymers is obtaining particular interest because long polymer chains will help the tubes dissolve in good solvents even with a low temperature. As most MWCNTs are generally inert and chemically resistant as a common approach to covalent modification (chemical treatment) of MWCNTs requires severe drying conditions after treatment with strong acids such as sulfuric acid, nitric acid and etc. Significant damages to the molecular framework of MWCNTs are inevitable. Speaking of acid treatment, the first use of concentrated H2SO4:HNO3 (3:1) mixtures to cut the highly entangled long ropes of MWCNTs into short, open-ended tubes with many carboxylic groups at the open end as reported by Liu et al. 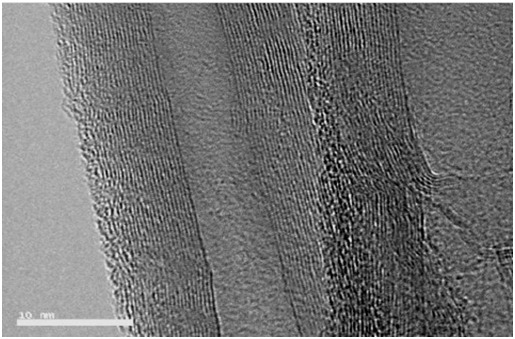 As a result of chemical oxidation, the ends and sidewalls of the nano-tubes are covered with oxygen-containing groups which have important implications for the electronic properties of these materials. This acid treatment method using a mixture of H2SO4 and HNO3 may effects on the diameter dependent length separation of single walled carbon nano-tubes as investigated by Kim et al. They observed that smaller diameter nano-tubes were preferentially shortened by the acid treatment process and migrated farther from the original sample. This technique can provide a preparative and scalable method for separating nano-tubes by length and diameter. 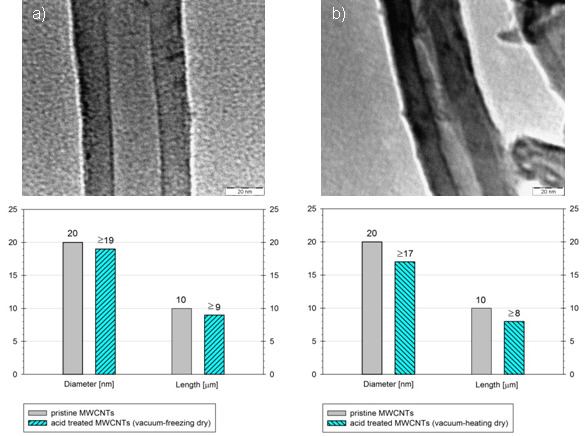 The influence of acid treatment duration on MWCNTs functionalized by H2SO4:HNO3 on length and diameter due to decreasing in oxidation resistance rather than the lower degree of crystallinity as discussed by Chiang et al. They found that if the samples are oxidized for two days they will have the most abundant surface carboxyl (COOH) and the highest oxidation resistance. In fact, functionalization of carbon nano-tubes is used to increase their disperse ability and to facilitate a uniformly distribution in polymers. It has been confirmed that refluxing nano-tubes with concentrated nitric acid creates acidic sites on nano-tubes such as carboxylic, carbonyl and hydroxyl groups and etc. Also the presence of carboxyl groups leads to a reduction of Van der Waals interaction between nano-tubes, which strongly facilitates the separation of bundles into individual tubes. Two main problems must be solved to prepare pristine MWCNTs reinforced polyester matrix: it is difficult to disperse pristine MWCNTs in the polyester matrix because the carbon nano-tubes are self-actively forming bundles and poor interfacial adhesion between MWCNTs and a matrix which are influences the MWCNT reinforcing effect. Functionalizing the MWCNTs with side chains that can form covalent bonds with the polymer matrix have proven successful in addressing these problems. Furthermore, during the functionalization of MWCNTs occurring disruption on the graphitic structure of MWCNT: uncapping that occurs at the end of the tubes thereby shortening the length of the carbon nano-tube. The main goal of this work is to avoid the self-breaking (shortening the length) that occurring while functionalization and enhance the disperse ability by finding effective dehydration methods in order to improve a process that allows MWCNTs to be incorporated into isophthalic resin to give light-weight and high-strength nano-composite materials. The results showed the effectiveness of vacuum-freezing dry method after functionalization by low concentration of sulfuric and nitric acid mixture as well as the low frequency of ultrasonication with pH neutralizing after which also minimized the damage and fragmentation of carbon nano-tubes. Pristine MWCNTs (CNT90, Applied Carbon Nano Technology, Korea) were used as a reinforcement in this investigation. 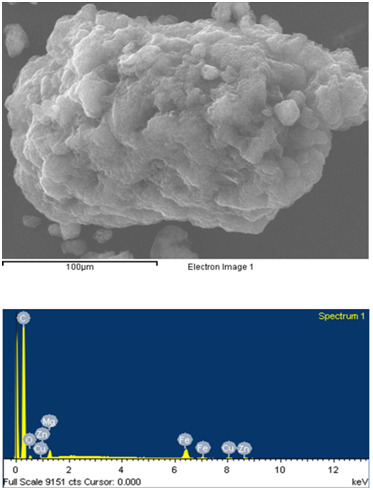 Physical properties of the MWCNTs were given in Table 1 and TEM images are shown in Figure 1. Table 1: Specification of pristine MWCNTs. Figure 1: TEM images of pristine MWCNT. Vacuum oven (OV-12, JEIO TECH Co., Ltd., Korea) was used to dry after acid treated MWCNTs by heating up to 120°C at 750 mmHg pressures within 24 hrs. Vacuum-freezing machine (OPERON SVQ-70, OPERON Co., Ltd., Korea) was used to dry after acid treated MWCNTs. Dry condition was arranged under -80°C at 1900 mmHg pressure during 24 hrs. In order to dehydrate of modified MWCNTs two 500 ml bottles were used at the same time. 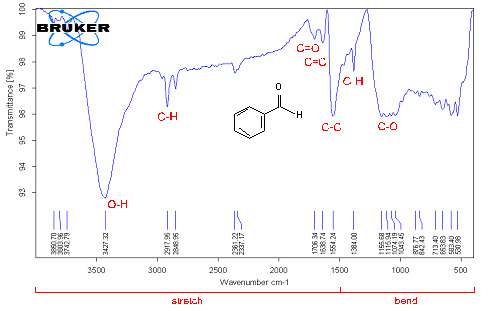 Fourier Transform Infrared Spectroscopy (VERTEX-80v, BRUKER Optics Co.) was performed to verify the existence of carboxyl group (COOH) on the surface of MWCNTs. The vacuum FT-IR spectrometers are based on the actively aligned Ultra-Scan interferometer, which provides PEAK spectral resolution capable of acquiring 100 full spectra per second at 16 cm-1 resolution. Resolving time spectral acquisition, with temporal resolution is 12.5 microseconds using an internal 24 bit analog to digital converter and signal to noise for acquisition of a 100% line spectrum. High resolution spectra in the visible spectral range demonstrate a resolving power of better 300,000:1. The FT-IR spectra of pristine and functionalized MWCNTs were recorded between 600 and 4000 cm-1. The samples were mixed with KBr powder and then sample pellets prepared with press device. Elemental analysis was analyzed with OPUS Software. Observation made by scanning electron microscopy (JSM-6380, JEOL Co.) which equipped with a gun type Thermal Tungsten Filament (TTF), with 2-stage zoom condenser super conical objective lens, which apertures three position controllable in X/Y directions. Three types of MWCNTs have been analyzed the surface morphology: pristine MWCNTs, and after modified MWCNTs with two different conditions. Test conditions: magnification was × 20,000 ~ 100,000 with resolution 100 nm at 15 kV accelerating voltage. The process involves passing a hydrocarbon vapor (CmHn) around 30 ~ 60 minutes through a tubular reactor in which a catalyst material is present at sufficiently high temperature (600°C ~ 800°C) to decompose the hydrocarbon as can be seen in Figure 2. MWCNTs grow on the catalyst in the reactor, which are collected upon cooling the system to room temperature. Figure 2: MWCNTs growing using chemical vapor deposition (CVD). The liquid hydrocarbon (C6H6, alcohol, etc.) is heated in a flask and an inert gas is purged through it, which in turn carries the hydrocarbon vapor into the reaction zone. If a solid hydrocarbon is to be used as the CNT precursor, it can be directly kept in the low-temperature zone of the reaction tube. Volatile materials (camphor, naphthalene, ferrocene etc.) directly turn from solid to vapor, and perform CVD while passing over the catalyst kept in the high-temperature zone. Also the catalyst precursors in CVD may be used in any form: solid, liquid or gas, which may be suitably placed inside the reactor or fed from outside. Hydrocarbon (CmHn) vapor when comes in contact with the “hot” metal nano-particles, first decomposes into carbon and hydrogen species; hydrogen flies away and carbon gets dissolved into the metal. After reaching the carbon-solubility limit in the metal at that temperature, as-dissolved carbon precipitates out and crystallizes in the form of a cylindrical network having no dangling bonds and hence energetically stable. Hydrocarbon decomposition (being an exothermic process) releases some heat to the metal’s exposed zone, while carbon crystallization (being an endothermic process) absorbs some heat from the metal’s precipitation zone. This precise thermal gradient inside the metal particle keeps the process on. 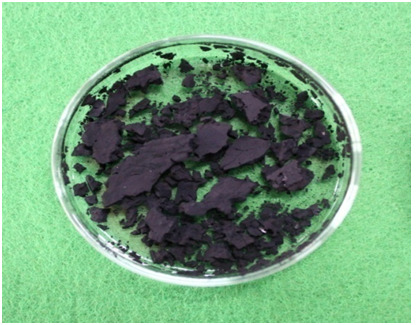 MWCNTs for this investigation synthesized by catalyst CVD, most effective method of chemical surface modification of carbon nano-tubes was to use sulfuric (H2SO4) and nitric acid (HNO3). Purification and chemical oxidation of MWCNTs was carried out by using mixture of acid oxidation method as shown in Figure 3. Figure 3: Schematic structure of MWCNT functionalization process. In order to get aqueous acid solution, 190 ml of 95% sulfuric acid (H2SO4) was mixed with 110 ml of distilled water. After that, 100 ml of 60% (HNO3) was added into the acid solution. In this study, to ensure 400 ml of nitric acid and sulfuric acid concentration (H2SO4:HNO3) acid mixture was in the ratio of 3:1 by volume per volume 4 g of as-synthesized MWCNTs with 400 ml of aqueous acid solution was added into a 1000 ml flask to treat. The flask was then immersed in bath ultra-sonication 75% operating with maximum amplitude at 40 kHz frequency for 10 mins at room temperature (25°C). The mixture was then stirred by magnetic bar at 200 rpm for 6 hours under reflux at 130°C. During the refluxing, dense brown gas was collected and treated with a NaOH aqueous solution connected to the condenser by a plastic pipe. The mixture after cooled down to room temperature, the reaction was diluted with 2000 ml of De-Ionized (DI) water and then vacuum filtered through a 0.45 mm millipore polycarbonate membrane filter paper. The functionalized MWCNTs was collected via discard method and then washed thoroughly with distilled water until the pH value of MWCNTs solution is approximately to pH 7. The stability of colloidal solutions as a function of attractive forces, such as Van der Waals interaction, and repulsive forces caused by the electrostatic of each carbon nano-tubes. The effect of pH is in fact a collision of two separate base factors – Na+ concentration and presence rest of the oxidation debris. The pH deviates from the iso-electric point; the more carboxylic groups become deprotonated, leading to a higher absolute zeta potential and enhanced dispersion stability. 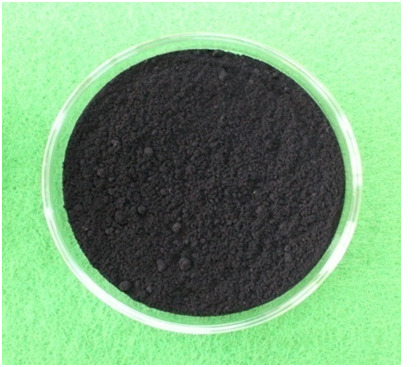 Hence, interaction with carbon nano-tubes is strong, low solubility at pH 2 - 5 and becomes weaker with increasing up to pH 7. Therefore until completely NaOH washed up to pH 7 due to the increased dispersibility of both the debris and MWCNTs, which weakens the interactions between carbon nano-tubes and a polymer matrix. In fact, the conjugate base of the carboxylic acid is resonance stabilized sharing the delocalized electrons between oxygen atoms. Only less than pH 7, where total detachment of the debris occurs, the solubility of unwashed carbon nano-tubes drops almost instantly. Constant values of carboxylic acids naturalized with acid dissuasion are ranging from pH 2 to 5 and are considered moderately strong acids such as sulfuric and nitric. In this investigation at least 4 times NaOH washing was performed to decrease Na+ concentration and increase dispersibility of acid treated MWCNTs, which allows the purity of acid treated MWCNTs to be around 98 - 99%. Vacuum-heating dry Remained MWCNTs after the last rinsed and filtered used a similar polyester membrane with 200 nm pores. In order to evaporate excess of acidic aqueous the MWCNTs were transferred into a 0.45 mm millipore polycarbonate membrane filter paper and lest to vacuum in a lab oven at a temperature of around 120°C under pressure 750 mmHg for 24 hours. After acid-water solution was completely drained and released with de-ionized water and neutralized up to pH 7 the MWCNTs was transferred into two 500 ml special glasses and carefully closed with plastic glass-pipe-cap. Capped glasses were then connected to a vacuum centrifugal concentrator though the plastic tube and dried under -80°C pumping down at 1900 mmHg for about 24 hrs as shown in Figure 4. Figure 4: Drying process in under -80°C pumping down at 1900 mmHg. The chemical modification is limited mostly to the opening of the tube caps and the formation of functional groups at defect sites along the sidewalls and length. Also strong oxidation conditions cause the graphene structure around the generated active sites broke, and the tube ends will cut off. Turns out oxidation process not only attacks defects but also takes action on the relatively integrated graphene structures as well. As matter of fact, the temperature of drying process also play vital role in functionalization step. To analyze the compassion of nano-tubes destructions and influence by chemical modification, filtered mixture was dried in two dry conditions; heating in an oven up to 120°C at 750 mmHg (Figure 5, a) and freezing in the centrifugal concentrator under -80°C at 1900 mmHg (Figure 5, b). Time of both drying process was for 24 hrs. a) vacuum-heating (hard and solid). b) vacuum-freezing (soft and powder). Figure 5: Samples obtained after performing two different drying conditions. As can be seen after performing vacuum-heating dry method we obtained weaker MWCNTs (F-VHD) with short length and damaged MWCNTs (a) than after vacuum-freezing dry method MWCNTs (F-VFD) (b) in Figure 6. State of outer and inner diameter of nano-tubes is also important factor to introduce the polyester hence strong bonding. From the Figure 6, side walls of nano-tubes are softer and porous (a) caused by freezing effect on dehydration process, clinched and shrinkage (b) of side walls caused by heating effect and also observed inner cracks which are results of bamboo structure. Figure 6: Dimensions of MWCNT after acid treated with different dry conditions. The drought sample was scraped from the filter paper and transferred into the mortar to crush by pestle until sample become granule. Unfortunately, some parts of MWCNTs were damaged during the process. Next step was powdering using bath type sonication; F-VHD MWCNTs were transferred into a 100 ml glass cup, following by pouring 50 ml alcohol and capping by plastic paper to avoid alcohol self-evaporation. Sonication was approximately 60 minutes at full amplitude (40 kHz) and bath condition was 25°C. After sonication, sample was placed into an oven and re-dehydrated overnight at 50°C. After acid-water solution was completely drained and released with de-ionized water and neutralized up to pH 7 the sample was transferred into two 500 ml special glasses. Capped glasses were then connected to a vacuum centrifugal concentrator though the plastic tube and pumped down to dry for about 24 hrs. Ice crystallization on the side walls of nano-tubes during the dehydration process were melted in an oven overnight at 50°C. Energy-dispersive X-ray spectroscopy analysis was performed to identify in-organic and metal impurities contamination in pristine MWCNT and F-VFD MWCNT samples. 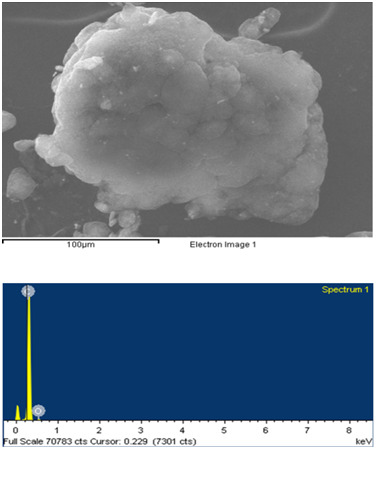 EDX investigation (Figure 7, a) showed the characterizations of the pristine MWCNT sample prove presence in-organic and metal impurities. After acid treatment metal impurities Mg, Fe, Cu and Zn in the F-VFD MWCNT samples disappeared (Figure 7, b), only carbon and oxide peaks showed high integration then in pristine one. Metal concentrations of pristine MWCNT were 1.54% - Mg, 6.89% - Fe, 1.51% - Cu, 1.02% – Zn as presented in Table 2. And for the carbon percentage of F-VFD MWCNT samples higher then pristine MWCNTs, but oxide percentage decreased. This indicates that the in-organic and metal impurities were extracted from F-VFD MWCNT by acid treatment. The observation from EDX showed that the effect of sulfuric and nitric acid treatment cased the concentration of in-organic and metal impurities lower and thereby enhancing the purity. This also indicates that the vacuum freeze-drying is also efficient to obtain dispersible MWCNTs. The purity of the MWNTs has been improved as the Mg–Fe–Cu–Zn catalysts do not present in the functionalized samples anymore. Although this result is confirmed by other, such as TEM and SEM observations, the purity of the MWNTs may not be indicated precisely by these microscopic observations. Figure 7: EDX spectroscopy analysis. Effect of the functionalization on purity of MWCNT by vacuum freezing method. Table 2: Percentage of metal impurities in the MWCNTs. Fourier Transform Infrared Spectroscopy (FTIR) analysis Fourier Transform Infrared Spectroscopy was performed in three types of MWCNTs: pristine MWCNTs, chemically modified MWCNTs by vacuum-heating and vacuum-freezing dry methods. The spectra average from 4000 to 6000 cm–1 scans were taken from samples pressed in pellets with KBr powder. In order to get accurate data at least 3 - 4 samples were tested to detect the carboxylic group (COOH). 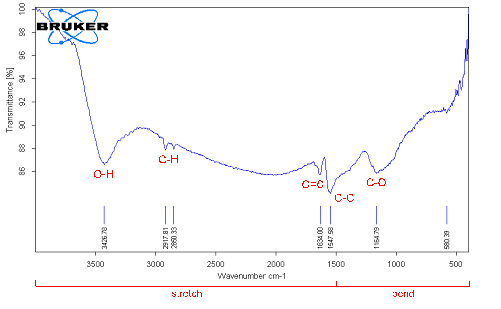 FTIR spectra of pristine MWCNTs have shown some weak peaks in Figure 8, (a) C-O (strong ester) stretching at 1172 cm–1, C=C at 1637 cm–1 (variable alkane), C-H stretching at 2920 cm–1 (strong alkane) and O-H (hydroxyl group) at 3427 cm–1 associated absorption band, but no carboxyl groups. That indicates that pristine MWCNTs have contained some defects on the sites of structure. Few peaks signal were found in spectra in the functionalized MWNCTs by heating dry method in Figure 8, (b). C=O (Carboxyl acid) peak appears at around 1718 cm–1 which is assigned to the presence of C=O stretching mode of carboxylic groups as a result of acid treatment. The feature at 3115 – 3740 cm–1 corresponds to the absorption of O-H stretching of hydroxyl groups and the C–O stretching band is at 1150 cm–1 and C–C stretching band 1558 cm–1. A peak C–O is stretching vibrations at 1150 cm–1 and C-X (strong chloride) stretching at 769 cm–1 of asymmetrical coupled vibration of C–CO–O. Also a peak which was identified at 1705 cm–1 characterized a clear indication of carboxyl groups in the functionalized MWNCTs by freezing dry method in Figure 8, (c). Unlikely, spectra of lower wave numbers are multiple overlapping peaks. That means the existence of carboxylic and carboxylate groups, and bonding. Compared with the corresponding results in peak in Figure 8, (b), the peak at 1705 cm–1 in Figure 8, (c) is much weaker. The intensity of the bands at 3425 cm–1 and at 1383 cm–1, corresponding to the (O–H) and (C–O) bands, respectively, increased. The peak at 1637 cm–1 assigns C=C bond in MWCNTs which is also increased due to the connection of oxygenated functional groups. Therefore, peaks at around 2917 and 2848 cm–1 correspond to the C-H stretch modes of H−C=O in the carboxyl group. Figure 8: FTIR spectroscopy analysis of MWCNTs after performing two different drying conditions. Scanning Electron Microscopy (SEM) observation Morphology study and structural observation of MWCNTs surface were analyzed by SEM. For comparison results three types of MWCNTs have been taken under the microscope: pristine MWCNTs, acid treated MWCNTs by vacuum-heating and acid treated MWCNTs by vacuum-freezing dry method. Through the SEM examination we identified that MWCNTs have different morphologies. Pristine MWCNTs has smooth and plexiform structural walls as shown in Figure 9(a). It’s practically impossible to align nano-tubes due to heavily entanglement without physical intervention. 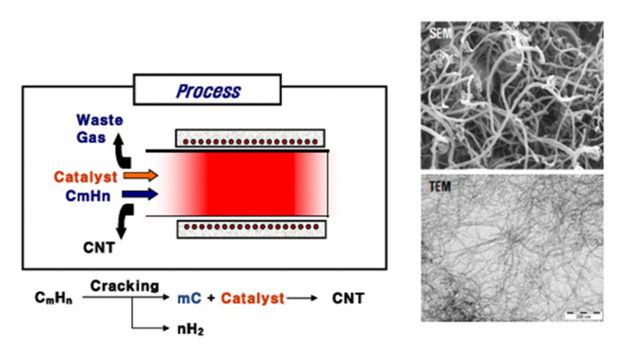 However, during the functionalization process the smooth structure of carbon nano-tubes had change to be rough after performing acid treatment as can be seen in Figure 9(b) and (c). This phenomenon might be associated with chemical functional groups attached on the surface of the carbon nano-tubes. Wall roughness was actually formed by defect sites via carboxylic group attachment to the side walls. Preliminary scanning of pristine MWCNTs detected presence of impurities such as catalyst as bright particles with bundles of nano-tubes. No existence of impurities was detected in the acid treated MWCNTs by both dry methods, which might be probably due to the oxidation with acids during reaction. Because catalyst used to manufacture MWCNTs and mostly composed of metal oxide that can be dissolved and oxidized with acids. Examination of acid treated MWCNTs showed that less structural damage was found on the surface of MWCNTs in vacuum- freezing dry type than other type. Also, resulting of tubes length might be shortened by the oxidation process and due to the condition of aqueous acid solution which caused severe structural damage to the MWCNTs structure through mixture scission effect. Figure 9: SEM images of MWCNT. The high resolution images with square mark indicating roughness of surface of MWCNT. Effective dehydration method for chemical modification of MWCNTs has been found and investigated in this research work. The aqueous acid solution is highly oxidative with the ability to break and open the end of tubes of MWCNTs depending on the technique used for the oxidation reaction. Low concentration of sulfuric and nitric acid mixture as well as the low frequency of sonication was applied in order to minimize the damage and fragmentation of nano-tubes during the functionalization process. Main goal was to obtain less damaged and strong bondable carbon nano-tubes with polyester matrix after acid treated; in our experiment we used two types of dry conditions such as vacuum-heating (120°C) and vacuum-freezing (-80°C). 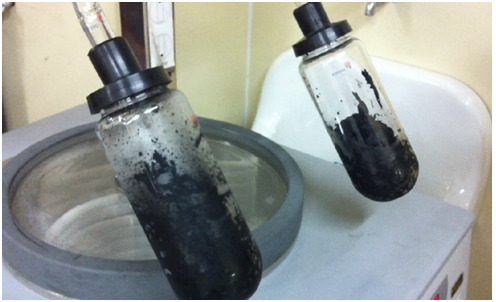 The results showed that the vacuum-freezing dry method provided the MWCNTs to be less damaged soft-powder type and more interactive carbon nano-tubes with polyester fluids. As confirmation the surface morphologies of the MWCNTs were characterized by FTIR, SEM and Raman spectroscopy. FTIR spectroscopy confirmed the higher amount of existence of the carboxyl groups (COOH). 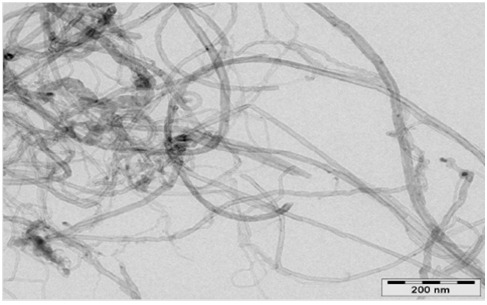 SEM observation showed that the functionalized MCWNTs was quite entangled from each other and formed an interconnecting structure. Also roughness of nano-tubes walls were actually formed by defect sites, which damaged due to harsh acid treatment and introduced via carboxylic group attachment to the side wall, and were significantly different from those of pristine MWCNTs. According to the results, the effective and optimal candidate as reinforcement for polyester matrix is MCWNTs functionalized especially by propitiate concentration of sulfuric and nitric acid mixture and dried by vacuum-freezing up to -80°C. Compared with other type of acid treatment this method generated carboxyl groups on the surface of nano-tubes effectively they can keep the structure to be uniform and less damaged. Functionalized MWCNTs were well dispersed in the polyester matrix due to well entanglement and strong bondable by generated of carboxyl groups and applying vacuum-freezing dry method. Moreover, their modified surface proved better interconnection with polyester matrix and thereby justified our expectation to further use. This research work was supported by research fund of Kumoh National Institute of Technology. 1. Rodney, S.R., Donald, C.L. Mechanical and thermal properties of carbon nanotubes. (1996) Carbon nanotubes 143–148. 2. Grobert, N. Carbon nanotubes – becoming clean. (2007) Mater today 10(1–2): 28–35. 3. Hamaker, H.C. The London-Van der Waals attraction between spherical particles. (1937) Physica 4(10): 1058–1072. 4. Prausnitz, J.M., Lichtenthaler, R.N., Gomes de Azevedo, E. Intermolecular forces, corresponding states and osmotic system. 3rd ed (1999) Molecular Thermodynamics of Fluid-phase Equilibria. pp: 57–117. 5. Ding, W., Eitan, A., Fisher, F.T., et al. Direct observation of polymer sheathing in carbon nanotube-polycarbonate composites. (2003) Nano Letters 3(11): 1593–1597. 6. Schueler, R., Petermann, J., Schulte, K., et al. Agglomeration and electrical percolation behavior of carbon black dispersed in epoxy resin. (1997) J Appl Poly Sci 63(13): 1741–1746. 7. Yang, K., Gu, M., Guo, Y., et al. Effects of carbon nanotube functionalization on the mechanical and thermal properties of epoxy composites. (2009) Carbon 47(7): 1723–1737. 8. Kuzmany, H., Kukovecz, A., Simon, F., et al. Functionalization of carbon nanotubes. (2004) Synthetic Metals 141: 113–122. 9. Zhang, Y., Shi, Z., Gu Z., et al. Structure modification of single-wall carbon nanotubes. (2000) Carbon 38(15): 2055–2059. 10. Liu, J., Rinzler, A.G., Dai, H., et al. Fullerene pipes. (1998) Science 280: 1253–1256. 11. Kim, Y., Lee, D., Oh, Y., et al. The effects of acid treatment methods on the diameter dependent length separation of single walled carbon nanotubes. (2006) Synthetic Metals 156(16-17): 999-1003. 12. Chiang, Y.C., Lin, W.H., Chang, Y.C. The influence of treatment duration on multi-walled carbon nanotubes functionalized by H2SO4/HNO3 oxidation. (2011) Appl Surface Sci 257(6): 2401–2410. 13. Zhang, W.D., Shen, L., Phang, I.Y., et al. Carbon nanotubes reinforced Nylon-6 composites prepared by simple melt-compounding. (2004) Macromol 37(2): 256–259. 14. Lustig, S.R., Boyes, E.D., French, R.H. et al. Lithographically cut single-walled carbon nanotubes: controlling length distribution and introducing end-group functionality. (2003) Nano Letters 3(8): 1007–1012. 15. Larson, A.R., Weber, E.J. pH dependence (1994) Reaction Mechanisms in Environmental Organic Chemistry 106–107. 16. McPhail, M.R., Sells, J.A., He, Z., et al. Charging nanowalls: adjusting the carbon nanotube isoelectric point via surface functionalization. (2009) J Phys Chem 113(32): 14102–14109. 17. Hirsch, A. Functionalization of single-walled carbon nanotubes. (2002) Angew Chem Int Ed Engl 41(11): 1853–1859. 18. Li, C.C., Lin, J.L., Huang, S.J. et al. A new and acid-exclusive method for dispersing carbon multi-walled nanotubes in aqueous suspensions. (2007) Colloids and Surfaces A: Physicochem Eng Aspects 297(1-3): 275–281. 19. Fiedler, B., Gojny, F.H., Malte, H.G., et al. Fundamental aspects of nano-reinforced composites. (2006) Comp Sci Technol 66(16): 3115–3125.